43 years ago Dean Atkinson and David Pontifex met in kindergarten and became fast friends. The rest is history for them. After years of friendship, they formed another kind of relation – a business partnership. Dean and David founded Atkinson-Pontifex in 1985 as a boutique construction company which focuses on high-end homes. Although registered to carry out both commercial and residential works, they have put their attention on the residential construction arena. While some may believe that mixing business with friendship can be a recipe for disaster, Dean and David have had quite the opposite experience. “It’s been a wonderful partnership right through the years,” says David. 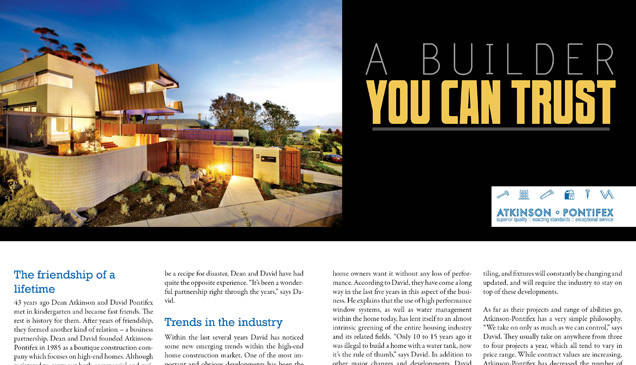 Within the last several years David has noticed some new emerging trends within the high-end home construction market. One of the most important and obvious developments has been the shift towards energy efficiency in both building methods and the active life of the home. While energy efficiency is certainly an area of concern, home owners want it without any loss of performance. According to David, they have come a long way in the last five years in this aspect of the business. He explains that the use of high performance window systems, as well as water management within the home today, has lent itself to an almost intrinsic greening of the entire housing industry and its related fields. “Only 10 to 15 years ago it was illegal to build a home with a water tank, now it’s the rule of thumb,” says David. In addition to other major changes and developments, David explains that there is, and will always be, ongoing refinements within the building industry. He specifically says that new products such as flooring, tiling, and fixtures will constantly be changing and updated, and will require the industry to stay on top of these developments. As far as their projects and range of abilities go, Atkinson-Pontifex has a very simple philosophy. “We take on only as much as we can control,” says David. They usually take on anywhere from three to four projects a year, which all tend to vary in price range. While contract values are increasing, Atkinson-Pontifex has decreased the number of projects they undertake. It is not uncommon for them to refuse projects, if necessary, in order to maintain their emphasis on quality. David stresses that the last thing they want to do is take on more than they can handle. “As a builder, we see it as our obligation to make an owner aware of all products out there,” says David. Atkinson-Pontifex focuses on high-end homes and when building from scratch, every owner has different wants and needs. David explains how they try to encourage owners to make informed decisions about what they are requesting in the building of their home. In the end it is always the home owner who chooses what to do or not do. In addition to budgeting issues, different things are important to different people, and Atkinson-Pontifex is there to help people make those choices. Atkinson-Pontifex specialises in boutique, high-end homes, while other builders specialise in their own specific areas. David explains the difficulties encountered when trying to explain the building process to home owners is part of the territory. He says that the selection of a builder is very important and it is crucial to have the appropriate builder for the project. “Builders’ backgrounds are all different. We have diverse backgrounds and our strengths vary enormously,” says David. He emphasises that owners need to engage in some research on different builders prior to selecting one. Another challenge Atkinson-Pontifex faces within the industry is convincing owners to make informed decisions about the materials being used in their home. While everyone’s budget is different, he explains how a little bit of extra money can go a long way. The extra money spent can provide owners with a higher standard home. Five to ten years down the road they will still have a high quality home, and upgrades made at the outset of the construction process will make a difference when trying to sell. At Atkinson-Pontifex, they have created a very close team. David describes them as family. He explains that every member brings something different to the table. Everyone has their own skills and strengths. “We go away most years, pre-Christmas, as a way of saying thank you to our team. We try to reverse the roles, my business partner and I. We cook and clean and wait on all of our staff for three or four days,” says David. They also make sure Atkinson-Pontifex’s employees are shown how appreciated they are. Additionally, even their subcontracting network is quite small and has been included as something like an extended family. “After a long time in the industry, you form networks and relationships with reputable people. We’re big on loyalty so if the company performs time after time after time, we generally give them the first option when another project comes along,” says David. Atkinson-Pontifex has stuck with what they know and who they know – it has proven an effective method for them. Atkinson-Pontifex were also the builders for the Chelsea Garden Show in London, in 2007, 2008, and 2010. During this time, they have taken different staff members there for about a month, with all expenses paid. It is an excellent opportunity for building experience for them with the added bonus of getting some quality travel time in. What separates Atkinson-Pontifex from the rest? Customer service. Atkinson-Pontifex were the winners of the Australian Achievers Award for Customer Service (Building & Construction) in 2006, 2008, and 2011 for a reason. David explains that it is their major point of difference. “When Dean and I take on a project, we deal directly with a client from the day we initially meet, right through until the day their home is completed. We’re onsite almost every day of the build,” he says. This sort of drive and commitment to their business is what has made Atkinson-Pontifex such a trusted name in the industry today. Despite increased recognition within the industry, David remains quite humble. He explains that they have no growth plans for the future; they simply want to maintain what they currently have. “Happy clients are all we want,” says David simply.